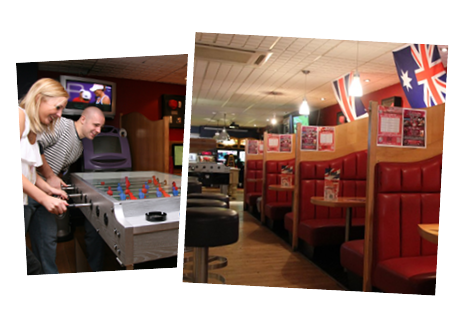 Bar Sport Cannock is one of the UK’s biggest sports bars, showing live sport all day, every day. We have over 60 HD and 3D TVs, giant screens surrounded by authentic sporting memorabillia, and the best food in town! Our Venue has 2 floors, comprising 5 bars, a luxury VIP lounge, private sports booths, a games zone, and a large sports function room which hosts events from boxing showcases to sportsmen’s evenings. There’s late night entertainment and live DJs every weekend, live bands every Thursday, and regular themed party nights and sporting events. So Bar Sport is not only the best place to watch all the live sport, but the perfect place to party too!